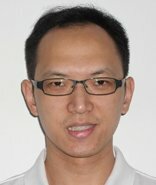 Khoo Teck Ping is currently a Ph.D. student in Singapore University of Technology and Design (SUTD). His research lies in the area of formal verification, particularly model checking. This is a branch of software engineering which holds promise to remove bugs in software and hardware. He feels fortunate to be able to pursue doctoral studies as part of an industrial collaboration between SUTD and his company. In his spare time, Teck Ping enjoys reading about technology and spending time with his wife and three kids.